Search Results for "syrian flag"
Painting Flag of Syria on old wood boards With four different ways. Animation of wooden grunge Syrian flag loop. Abstract flag background for your text or logo. 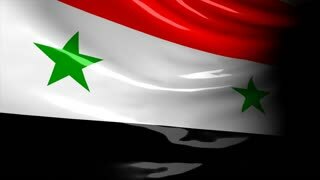 drawing Syria flag full hd and 4k. Painting Flag of Syria white paper with four different ways. Drawing Syria flag on grunge paper loop. Syrian flag Graffiti on white wall. Animation of Syria flag full hd and 4k. Close-up flag of Syria ripples in a breeze. Syria Flag waving in slow motion with highly detailed fabric texture loop,Creased textured Syrian flag in slow motion with visible wrinkles and seams full hd and 4k. Syrian flag waves on white. The symbol of the country is animated. Seamlessly loopable waving Syrian flag animation. 4K ultra high definition. Crisis location map series, Syria. 4K High Definition animation. Flag of Syria. Seamless Loop. Heart in colors flag of Syria pulses, loop. Animation flag of Syria. The current wave of liquid satin Britain. The cloth movement is repeated on the wind. National symbols of the country. Background flowing fabric in motion.